my ramblings | expressions: Yikes! JackieLand! A couple of months ago, California Fitness announced its partnership with internatinoal superstar - Jackie Chan. The partnership includes the creation of California Fitness Jackie Chan signature clubs - the first of which will open in next month at Prestige Tower, Nathan Road, Kowloon. As inspiration to members, clubs will feature large custom-made murals and Jackie Chan memorabilia, inspirational photos and club designs as well as exclusive "Jackie Chan classes," (yikes!) which will capture the beloved action hero's infectious spirit, energy and passion. If you can't get enough of Jackie Chan. 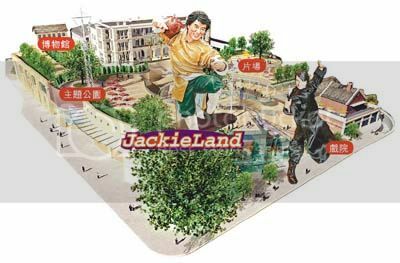 Jackie announced that he will build a theme park- JACKIELAND in Hong Kong (double yikes!). Here's a pic of the proposed theme park. If you can't read mandarin, from left to right - Museum, Theme Park, Studio, Theater. hahaha.. this guy is going too far with his fame! I wonder what will it be next? ArnoldLand? Such a great post about custom made murals. Keep on posting! Yikes! JackieLand! Such a great post about custom made murals. Keep on posting!